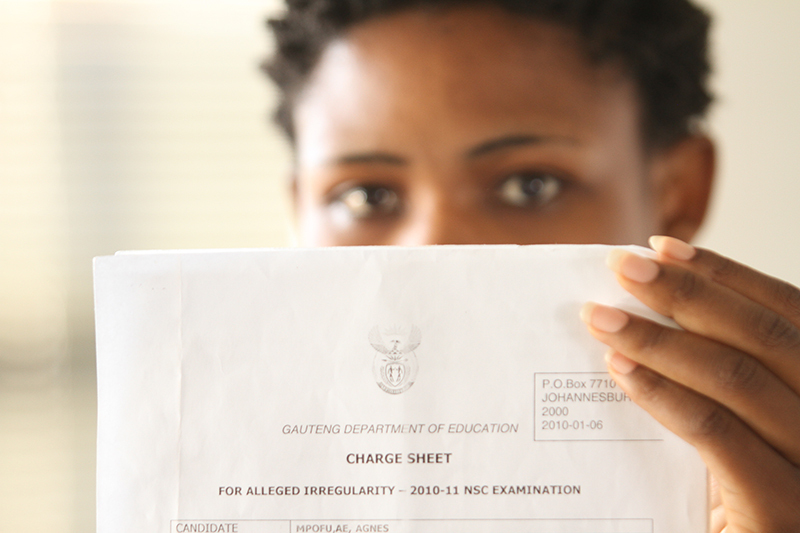 A WITSIE is a year behind in her studies because her former school was involved in the first matricm exam fraud in the history of the Gauteng department of education (GDE) to involve ghost writers. Elizabeth Mpofu, 2nd year LLB, was one of the “35 to 40” students who had irregularities in their final matric examinations. While she and the other students wrote their exams in good faith, their former schools had allegedly brought in other people to write exams under their names. The two implicated schools, Robin Hood College and Vine College in the Johannesburg CBD, are private independent schools with the same director. Both receive larger government subsidies if their final matric pass rates are high. Wits Vuvuzela was not able to obtain comment from the director of the two schools at the time of going to press. His cellphone message told callers that he was currently out of the country. Mpofu wrote her matric in 2010 at Vine College and passed all her subjects -except for one. All the students affected by the fraud were initially called to face charges of irregularities before the GDE, but were found not guilty. Approached for comment, GDE spokesperson, Gershwin Chuenyane, said it had been recommended that the candidates’ marks be declared null and void and that the principal and all the educators from the two colleges be suspended from conducting any examination activities. The schools had to be de-registered as examination centres. The GDE has taken over all examination activities and administration of the National Senior Certificate exams at the two colleges since 2011. But Chuenyane said the GDE could not institute charges against the principals and educators of Vine and Robin Hood Independent Schools because “they were not employed in terms of the Employment of Educators’ Act”. Another former pupil affected by the fraud, Nonhlanhla Siwela, said she too had to wait an entire year to re-write her examination. Siwela had two blocked subjects:physical science and life sciences. The principal of the school in 2011, a “Mr Sibanda”, was present at her disciplinary hearing. “He told us to tell the board that the papers did belong to us. We all knew that they did not belong to us because the handwriting did not match our own. Siwela said they were upset that the department had not told the former learners what action had been taken against the schools and their staff. They feared the evidence had been destroyed. Another affected learner who studied at Vine College, Thabitha Ndlovu, discovered during the GDE’s investigation that three subjects, life sciences, physics and mathematics had been written for her. The ghost writers had passed the subjects with results of over 60%.